There are few things better in life than a well cooked steak! 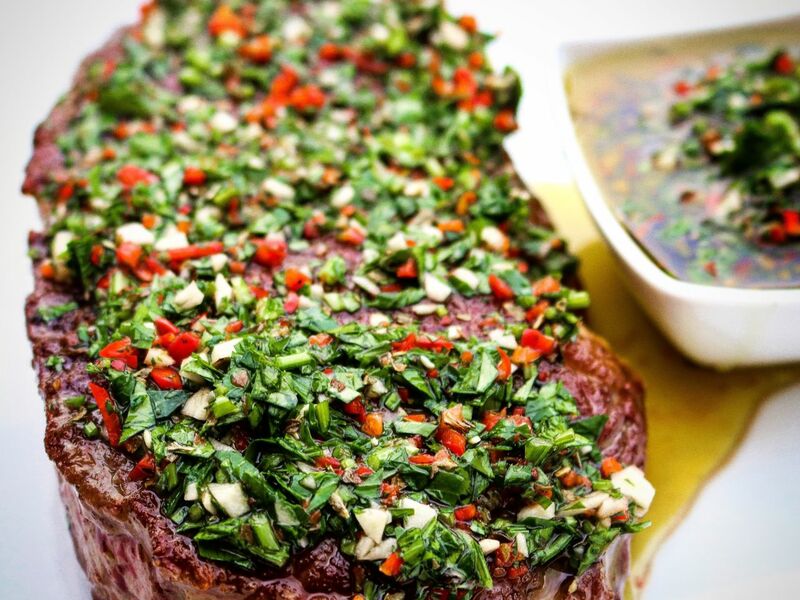 Chimichurri is a Argentinian salsa that is fresh spicy and and that works perfectly with beef or chicken. If you want to slice the meat to put in tortillas or just to eat as it is it’s up to you. This recipe will make enough sauce for about 4 steaks. Good pinch of salt and pepper. 1. Prepare your chimichurri by finely chopping the parsley, garlic and chilli on a chopping board. 2. Add the mix to a large bowl then add the oregano, olive oil, lime juice, red wine vinegar, salt and pepper. 3. Leave the sauce for 30 minutes in the fridge to allow the flavours to infuse. 4. Time to cook your steak. Season the steak on both sides then place in a smoking pan with a little oil. Don’t turn the steak until you have a good char on one side. Finish the steak with a good knob of butter. Remove from the pan and allow to rest for a few minutes before topping with the Chimichurri.